The Griffin Survivor Clear Case keeps your iPhone 8 or iPhone 7 safe from shocks and drops with its Impact Dispersion System, 6H hardness rating and military-grade protection. The Griffin Survivor Clear Case is made from ultra-slim optics-grade polycarbonate, keeping your iPhone 8 or iPhone 7 looking stylish while ensuring it's safe from damage. 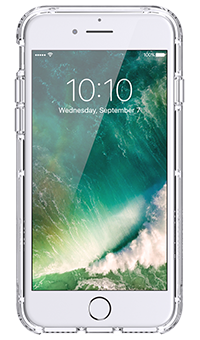 Built from premium optics-grade polycarbonate, the Griffin Survivor Clear Case provides protection for your iPhone 8 or iPhone 7 against knocks. The built-in Impact Dispersion System absorbs drop forces before they damage your phone. The ultra-slim Survivor Clear's impact deflecting bumper and anti-yellow rubber material protect your device from bumps, while the special high-gloss formula and 6H hardness protection rating safeguard your iPhone against scratches too. With Military Standard 810G protection, the Griffin Clear case ensures your iPhone 8 or iPhone 7 withstands drops from up to four feet, so you don't have to worry if it falls out of your hand, bag or pocket.